The traditional stone-built buildings known as longhouses started life, since their earliest beginnings in the 13th century, as the happy result of the long established habit of mixing human living quarters with livestock, usually cattle or sheep, under one roof. You’re most likely to see an example of a longhouse in western Britain, and Devon especially. If you’re wanting to know if you have a longhouse on your hands, the giveaway construction of a long, single-story, gable-ended stone building, facing lengthwise down a hill and including a central ‘cross passage’ splitting it into two rooms, is your first clue. The cross passage with doors at either end, at winnowing time, would have been propped open to provide ideal conditions for a breeze to blow through and winnow grain. The family would have lived in the higher end of the building while their precious animals were tethered in the lower area, called the ‘shippon’ or ‘shippen’, a word you still hear used today for a livestock farm building. This practical arrangement allowed the slurry from the farm animals to drain away through the end wall. Living with livestock made a lot of sense and kept the animals safe in harsh weather and the heat they gave off must have been appreciated by their owners in the thick of winter. You could say this was an early form of ‘green energy’. 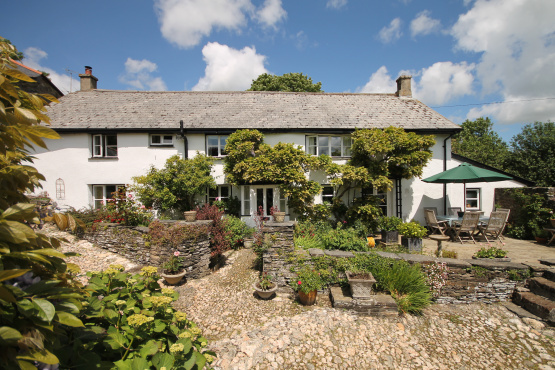 An example of a Devon longhouse now a charming home is Larcombe Farmhouse in Diptford, SOLD off a guide price of £745,000 through Marchand Petit’s Totnes office, 01803 847979. The detached four bedroom home overflows with period qualities including inglenook fireplaces, one with a bread oven, Aga, beams, nooks and crannies and a quaint little cupboard in the dining room, formerly the ‘turnip chute’, once used to post turnips from the main drive. Intriguing signs of former use can be seen in the layout, such as the farm dairy now the dining room, the study where the cream was made and butterwell to the rear outside the back door, all adding to the appeal of the property. Interestingly some fittings such as the front and dining room doors are original as is the spiral staircase rising from the kitchen. A second staircase was added in Victorian times, as adjustments to living arrangements advanced over the centuries right up to the present, to offer the longhouse of the 21st century. Marchand Petit staff in offices throughout the South Hams and within the Prime Waterfront & Country House Department, are always delighted to take on longhouses to sell or let, as these properties bring such a wealth of history with them.